Ah well that's a shame. I was worried about this being the case, especially after looking at the Dromaeosaurus hands and primaries. That would have been the perfect opportunity for them to be attached to the second digit then. It's not a huge deal breaker though, since they can probably be posed or displayed to have that obscured. At least the figures included in the accessory packs seem to get that detail right at least. Anyways, thanks for the correction Sim. I thought David meant that the primaries of the larger raptor series figures would be attached to a part of the second finger... I'm not sure that would be incorrect for these animals, particularly after seeing how the primaries are preserved on the fossil Zhenyuanlong specimen. Maybe it would be good to ask David for clarification on this on Kickstarter? They seem to be attached to the wrist in most of the images, and I believe that was the case when I saw them in person last year. I can ask him though how they're intended to be on the final figures. Here's an example of what I meant in my previous post about the Dromaeosaurus. It's Papo that initially called it young Apatosaurus, can't remember if it was listed on Papo's site as such back when it was released. What I clearly remember is that Papo's sculptor himself said it was the company's will to call it like that, to keep the scale consistent with the Brachiosaurus. But I believe that it wasn't conceived by Mr Seo as a juvenile or subadult at all. In any case now is listed on Papo's site simply as Apatosaurus, so I consider it like an adult, just in a smaller scale then the other sauropod in the line. Unless Papo comes up with a huge Apatosaurus model that automatically becomes the adult counterpart, but I think that is an unlikely eventuality. I would personally prefer another sauropod in a similar scale to the Brachiosaurus. Interestingly enough, being pterosaurs currently discussed in another thread, I recall from the same source, quite possibly that famous interview on Papo Korea's blog, Mr Seo saying he regretted making the Tupuxuara that small. Speaking of the Papo Apatosaurus, did they ever say what scale it is supposed to be? I heard 1/60 or 1/50 scale. I want to know because I was thinking of picking this figure up. 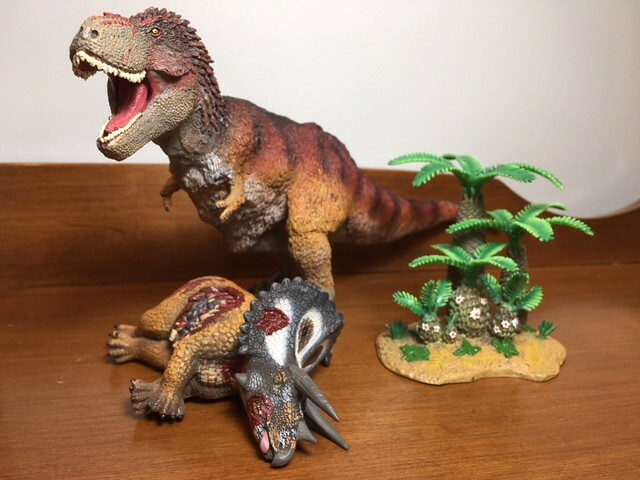 I tend to prefer my figures to be on the smaller size these days, especially sauropods. Thanks- that's too big for me. Guess I'll keep looking. The model certainly feels small in my collection. I think it is roughly the size of the Papo Triceratops, but the tail is quite longish. Yes, body size is comparable to that of Triceratops. Guest reviewers: the blog still needs a review of the cave bear if any of you happen to own it!